People who ride the Slipstream or see it pass are amazed at the pickup and top speed. The Slipstream uses a 1 horsepower motor. This is the rated capacity. The electric motor can easily produce short bursts of 2 to 3 horsepower for passing and hill climbing. While the Slipstream moves along nicely with 1/2 horsepower from the motor, there are times when additional power is required. Electric motors are much better at providing this power instantaneously than their gas powered counterparts. The Slipstream consistently beats cars off the line at traffic lights. Riding around town on a Slipstream catches lots of eyes, prompts many questions and is just plain fun. The extra power not only enhances the rider's satisfaction in using the Slipstream as a dependable mode of transportation, but also aids in illustrating just how powerful and practical today's electric vehicles are. Get ready to clear your mind of all your preconceived notions regarding electric powered transport because the Slipstream is part of a new era of electric vehicles. The Slipstream concept is a very simple one. 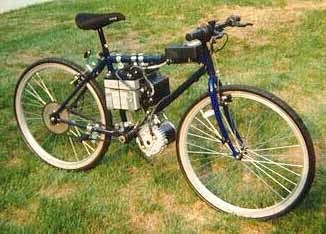 A motor, a set of batteries and a throttle are mated to a mountain bike frame. The pedals, all original gears and derailleurs need to be stripped from the mountain bike. The motor is added and linked to the rear wheel using a heavy duty chain and a large gear on the rear wheel to reduce the motor's speed. The motor is hooked to a throttling mechanism, which controls the amount of power flowing to the motor. The throttling mechanism is then hooked to the batteries. The gearing from the motor to the rear wheel is a balance between top speed and low end torque. One of the great aspects of electric motors is their very wide torque range. 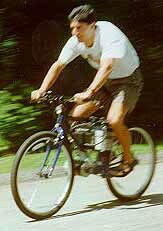 Hence, multiple gears are not needed and the Slipstream performs extremely well with a fixed gear ratio. You can make a Slipstream that will go 75 mph, but will be very slow to start. It would be like trying to pedal your 10 speed from a standstill in the hardest gear. Not very easy. And best of all, if you already have a bike a Slipstream will cost about $750 (for those in the US) to build. Some folks have even built scaled down versions for around $550. Click here to see more detailed technical specifications. Our plans enable builders of all skill levels to construct a Slipstream using a bicycle they already have. Constructing a Slipstream is straightforward and all major components are available through mail order from component suppliers. These components can be shipped to almost anywhere in the world. All other materials can be picked up from your local hardware store. If you aren't sure whether you can obtain all the needed components in your area, feel free to email me. I'll let you know if we have customers in your part of the world and whether they were able to procure the components from all suppliers. Construction requires about 10 hours.